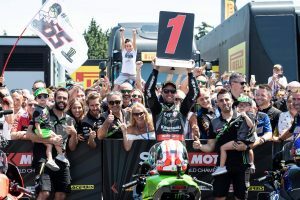 Jonathan Rea (Kawasaki Racing Team WorldSBK) has taken his second win of the weekend at the Misano World Circuit Marco Simoncelli after a scorcher of a race around the Rimini track. 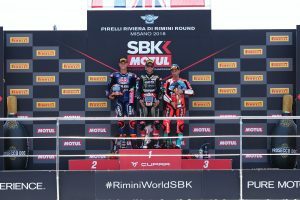 Race two in the Pirelli Riviera Di Rimini Round provided a 21 lap thriller, with countless overtakes and the battle going down to the wire under the sunny skies. 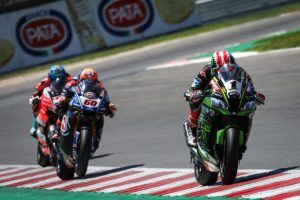 With all riders being forced to dig deep to hold their position to the line, it was Rea who came out on top, beating Michael van der Mark (Pata Yamaha Official WorldSBK Team) with three laps to go. 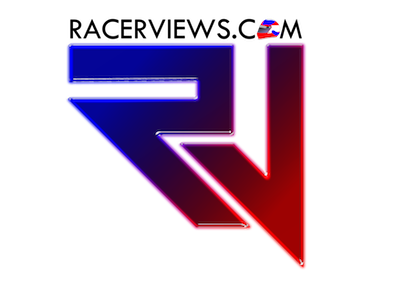 Just one race away from a two month summer break and everyone eager to impress, the opening laps provided edge of your seat racing, which never stopped. Xavi Fores (Barni Racing Team) made a blistering run at the lights, flying into first place, but a technical issue ended the Spaniard’s race just two laps later. Meanwhile, Rea jumped straight up to fifth, but was then caught up with Chaz Davies (Aruba.it Racing – Ducati) on the second lap. With van der Mark making the most of the open track ahead, Rea was left to fight through, with both factory Ducati bikes in his sights. Rea’s duel with Davies saw the defending champion coming out in front after an ambitious move through Turn 14. 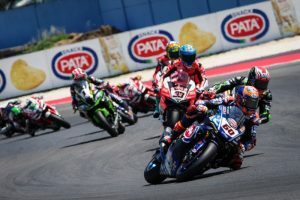 Then, with both Rea and Marco Melandri (Aruba.it Racing – Ducati) finding their way past Tom Sykes (Kawasaki Racing Team WorldSBK), the pair engaged in an electric battle all through laps seven and eight, trading places several times for second. Davies finally crossed the line in fourth, not quite able to consistently match the front pace. A difficult end after a promising start for the Welshman, who now enters the summer break 89 points behind Rea. He finished ahead of Sykes in fifth.